The banners are going up for AWAKENED 2017.. the count down has begun! Earlybird 3 days for the price of 2 entrance. I have realised that the Earlybird 3 day entrance ticket was on eventbrite for £15, when in fact the prices are the same as last year so should be £12 adult & £8 child. This ticket is 3 days entrance for the price of 2 which also allows entrance to the FREE workshops across all 3 days. This is an earlybird only ticket. The link has now been changed & anyone that has already purchased this ticket will be refunded the £3 😉 this ticket will only be available in advance of the event. 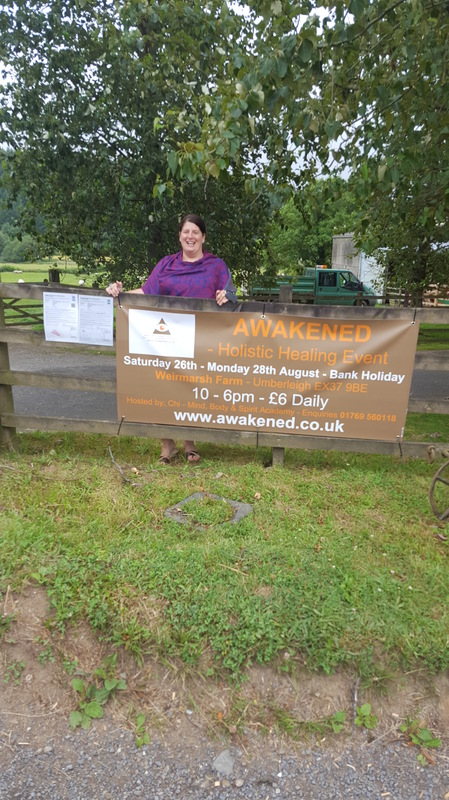 The AWAKENED Holistic Healing Event ticket are now live.. the link to book for Camping, Entrance & Evenings is https://www.eventbrite.com/e/awakened-2017-tickets-33099963883. So we look forward to sharing this vibrational event with you all. You can bring your own Tent or Camper van or hire a Bell Tent for the weekend ~ either way the same minimal camping fees are charged. We are very pleased to be bringing these beautiful Bell Tents to the AWAKENED – Holistic Healing Event in 2017. They will be set up for your arrival so you can focus on Relaxation & enjoying all the event has to offer. Great site visit today.. creating the AWAKENED Holistic Healing Event with Love & Unity..
More lovely souls resonating with the vibration of this event and gathering to exhibit.. such a lovely day working on this special event.. let it begin..
We have increased the pitches slightly this year so a few now available for those wishing to attend. Such a positive foundation to build the AWAKENED Holistic Healing Event for our 2nd year. Beautiful venue within the Taw Valley by the river.. camping & tickets available in March. Unity.. Love.. Gathering of like Minded Souls.. & Raising Vibration..! AWAKENED Holistic Healing Event 2017.